It’s become one of my favorite cookbooks of all time. If I ever got wild enough to KonMari my books - which, fat chance there considering I’ve been intending to handle my closet since before Thanksgiving - it’d be top ranking on the Sparks Joy list. But why, though? Glad you asked. First of all, it’s good looking and chatty like me, lol. Aside from it’s conversational tone and easy going photo styling, Dining In slays me for how seamlessly it combines some truly funky and inspired recipes (Chicories with Anchovy Breadcrumbs and Egg Yolk, hello) with some standard favorites (like this trout we love), all under the umbrella of just eating well at home. No schtick required. Throw in some excellent fish entrees, a wide array of homestyle sweets*, and a handful of ways to cook a perfect piece of chicken every time (Anchovy-Butter Chicken with Chicken Fat Croutons is my favorite hands down), and what more could you ask for? I guess maybe some sauces - but it has those too! And while it was clearly written for people who are serious about making a nice meal at home, it refuses to let you take yourself too seriously while doing it. The recipes for Matzo Brei and Avocados with Everything make sure of that. In general, Alison Roman’s vibe of “hey just give it a go and see how it turns out” is so refreshing to me. She keeps it flexible and fun, and makes complicated things approachable. A motto to live by, and yeah I mean that about cooking - she almost has me over here making whole fish with eyeballs...almost - but also about life in general. It’s a new year for me, I turned 34 last Sunday. That means I’ve been an attorney for almost 8 years, known Cos for 7, and have been working on this blog for 3. Sometimes it doesn’t feel like it, but it’s really all happening. Like actually! I just need to remain chill and keep it flexy, taking on the challenges one step at a time. Maybe even have some fun with it. Amen. *Can you believe I wrote a whole post about this book without mentioning The Cookies? Me neither. Slice the squash into ½-inch thick rings. Then use a soup spoon to scrape the seeds out of the center of each slice. 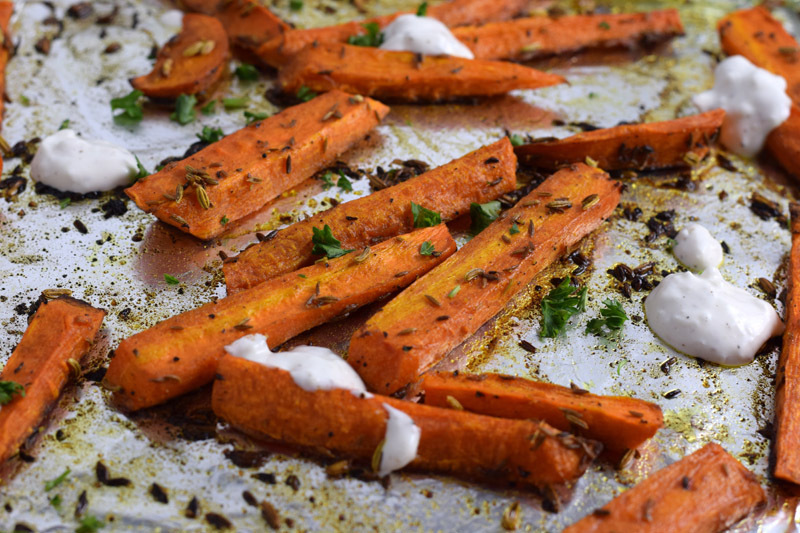 Transfer the squash to a rimmed baking sheet and toss with the oil and honey; season with salt and pepper. Roast the squash for 25 to 30 minutes, flipping at the halfway point. **The flip is critical! The moment between a perfectly bronzed char and ya burnt goes by fast here. Meanwhile, make the gremolata. Toast the coconut in a small skillet over medium heat until it browns at the edges, 3 to 5 minutes. Place it in a medium bowl to cool. If you leave it in the pan it’ll burn. Once the coconut has cooled down a bit, add the scallions, cilantro, and lemon zest. Mix everything together really well with your hands (the original recipe notes that the lemon zest is prone to clumping up), and season well with the red pepper and kosher salt to taste. 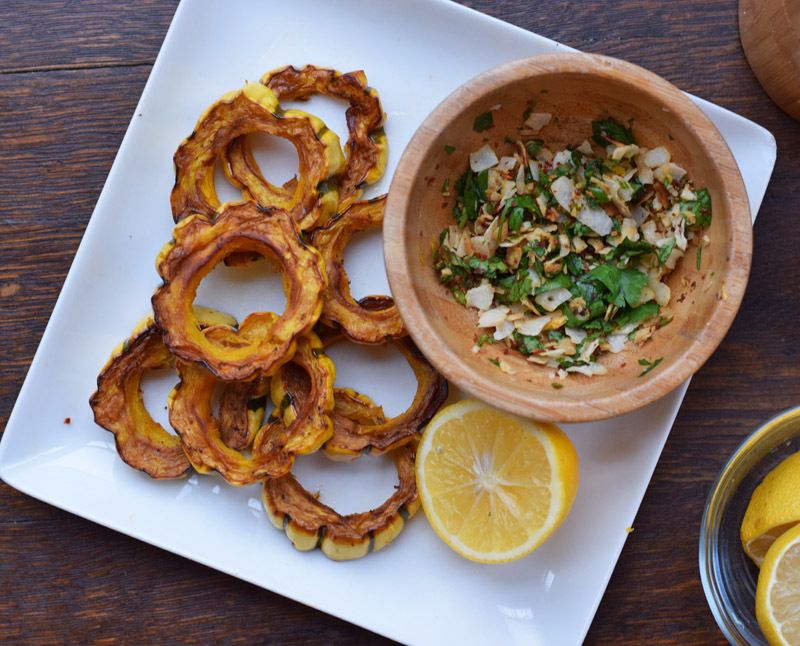 Assemble the squash on a plate and sprinkle the gremolata over to serve.